Call-in lines, which are for media only, will open 15 minutes prior to the start of the call. FTC staff will be available to take questions from the media. 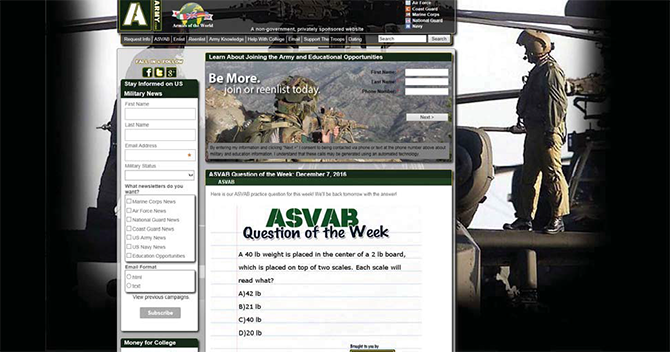 The operators of copycat websites army.com and navyenlist.com have agreed to settle Federal Trade Commission charges that they targeted people seeking to join the armed forces and tricked them by falsely claiming to be affiliated with the military in order to generate sales leads for post-secondary schools. According to the FTC’s complaint, which was filed by the Department of Justice (DOJ) on behalf of the Commission, the defendants have used copycat military recruitment websites since at least 2010. 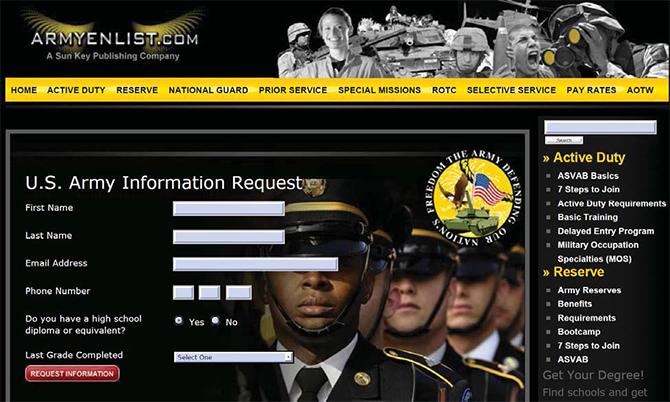 Some of the websites, such as army.com and armyenlist.com, appeared to be official recruiting websites affiliated with the U.S. military. The websites prompted consumers to submit their information to learn more about joining the armed forces, according to the FTC. The complaint alleges that the defendants promised to use the information consumers submitted to the site only for military recruitment purposes and not to share it with anyone else. In addition, people who submitted their information allegedly received follow-up phone calls from telemarketers who continued the misrepresentations by posing as members of the military, touting specific schools, and giving consumers the false impression that the U.S. military actually endorsed those schools. This action is part of the FTC’s effort to combat government imposter schemes, the most frequent type of fraud complaint from military consumers in the FTC's Consumer Sentinel database. It also builds on the agency’s work in the area of lead generation, including its examination of various players involved. The proposed orders also ban the defendants from misrepresenting a military affiliation, the endorsement of particular schools by the military, or the extent to which they share consumers’ personal information. They require the defendants to disclose that their sites are not official recruiting websites of the U.S. military, to solicit consumers’ acknowledgement of that fact, and to get permission to disclose consumer information collected in connection with lead generation for any purpose. The defendants also must notify the companies that bought consumer data from the defendants of the FTC’s allegations and instruct the companies to stop using the information. The first proposed order settles the FTC’s charges against Sunkey Publishing Inc.; Sun Key Publishing, LLC; Wheredata, LLC; and Christopher Upp, individually and as an officer of the corporate defendants; and Mark Van Dyke, individually and as an officer of the corporate defendants. The second proposed order settles the FTC’s charges against Fanmail.com, LLC; and Lon Brolliar and Andrew Dorman, individually and as officers of Fanmail.com, LLC. If you think you have gotten a call from a government imposter, report it to the FTC at FTC.gov/complaint. If you’re interested in information on military recruitment, please visit this site from the Department of Defense for more information. The Commission vote approving the complaint and proposed orders and referring them to the Department of Justice for filing was 5-0. Commissioner Rohit Chopra and Commissioner Slaughter issued a separate statement. The DOJ filed the complaint and proposed consent orders on behalf of the Commission in the U.S. District Court for the Northern District of Alabama on September 6, 2018. NOTE: The Commission refers a complaint for civil penalties to the DOJ for filing when it has “reason to believe” that the law has been or is being violated and it appears to the Commission that a proceeding is in the public interest. Stipulated final orders have the force of law when approved and signed by the District Court judge. Blog: Camouflaged commerce: What was going on at army.com?